Spring is for sure my favorite season. I like to take walks and I like flowers and I think the first couple of weekends of spring, when everyone is anxious to spend time outside, are like waking up from a long hibernation. This was an especially snowy, unpleasant winter, so it’s kind of nice to see lots of sunny days in the forecast. I took a long walk through the neighborhood this afternoon, admiring all the flowers blooming. 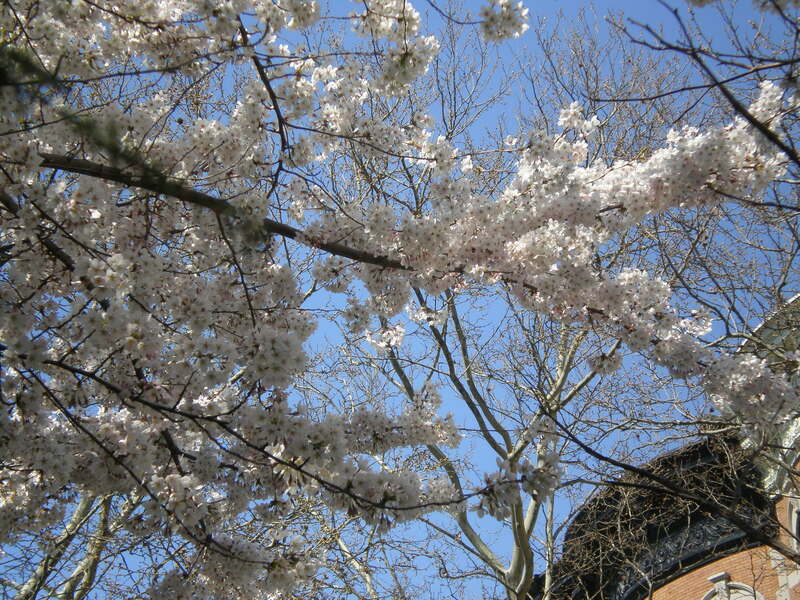 I always forget how many cherry trees there are in Brooklyn until they start blooming in April. I’m finishing up a novella that takes place during the winter, and it’s very hard to write about blizzards when it’s so sunny and warm out! My Kindle might be developing an inferiority complex now that the iPad is out. I have some reservations about the iPad—I wish it ran OS X, I’m worried reading novels on a backlit screen will give me headaches, I’ve heard the iBooks store (or whatever they’re calling it) is still kind of clunky, though I imagine that will be improved—and have other more essential gadgets to buy first—my ancient iPod is about to kick it—but, golly, it’s pretty. Speaking of the Kindle, I made a vow a couple of weeks ago that I would not buy any more books for it until I made a serious dent in the backlog of books on it. I did read a number of books that have been sitting on it for months, but ultimately, I’m weak, and I just bought two new books and am eying a third. It’s a disease, my need to buy books! On the other hand, I’m finding that one of my favorite Sunday-afternoon leisure activities is to sit by the windows in my room and read as the sun sets. I’m trying to turn my attention to a different work-in-progress right now, which is tough. I’m having trouble writing the end of the first chapter, but know pretty well how the later chapters shake out, so I can’t decide if it’s worth it to skip this and come back to it later, to write what I know will come easier, or to force myself to work out the problems with the first chapter before moving forward. Dilemma! Well. I hope you all have a lovely spring week. I’ve still got a little bit of sunlight left tonight. I should make the most of it.